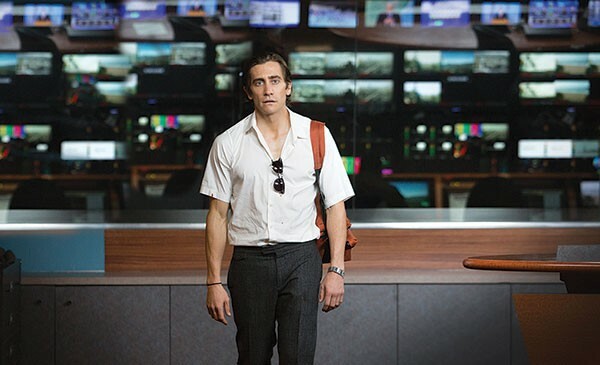 Louis Bloom (Jake Gyllenhaal) is a loner who covers up his lack of people skills with a glib conversational style. After seeing some freelance cameramen capture footage for local if-it-bleeds-it-leads TV-news shows, Bloom gets into the business himself. At first, his keen eye, smooth talking and even emotional detachment make him a perfect fit to be a nightcrawler, keyed to the police scanner hoping to be first on the scene. But in writer-director Dan Gilroy's thriller-slash-character-study-slash-media-harangue, Bloom is a true creature of the night. He's a sociopath, without boundaries, and the real horror isn't the violence of car crashes or knifings, but how easily Bloom molds himself for an acceptable presentation. Here, Gyllenhaal transforms his seemingly unthreatening sad-sweet puppy-dog looks into something pretty creepy. The film's third act gets pulpy, and while the action is thrilling, the story suffers from a lack of credibility. Gilroy also makes heavy-handed points about the shallowness and amorality of television news (even spelling out some critiques), and this clunkiness trips up the film's better, hazy ride-along nightmare vibe. Still, it's an entertaining, bubbling mix of black comedy, car chases and bad behavior — plus Gyllenhaal's freaky, unblinking lemur eyes staring right through you.